Every once in a while I gain a new client from "corrective color" experiences. The cases vary from do it yourselfers (box color) to previous hairstyists. Error can happen from improper application, damage from too high developers or overprocessing or so fourth. I never talk bad about another hairstylist's work as it would just be in poor taste but I do like to ask questions about previous hair color/chemical history to make the best judgement on color. So is the case with my lovely client Courtney, she had a previous hair color lightening job done that she was less than thrilled about. Most importantly, is the consultation and I need to really understand her wants and needs when it comes to visualizing her ideal hairstyle. In this blog I will show before and after images along with images of application and formulation. She ultimately wants to be lighter along with a fringe and shapely layers. Courtney's hair is very thick with a slight wave pattern. A level 6 with natural red understones. Courtney opts for low maintenance and comes into the salon every three to four months so balayage applications are ideal for her hair. She has no grey so I do both a foil and open air hair color technique (there are many numerous ways to go about correction but I found this technique to be easily executed). I'll be diffusing the points of lightener a few inches from her regrowth since she wants that "lived in look". I did an all over finely foiled highlight about 3/4 inch about. I used Redken's Flash Lift lightener with 20 vol along with pH Bonder. Afterwards I balayaged all the exposed hair with Redken Free hand clay lightener and 40 vol with pH Bonder and allowed to process at room temperature for 45 minutes. After processing hair was shampooed and treated. Shades EQ gloss was applied all over to her blown dried hair for 20 minutes. Formula 1 oz Crystal clear 1/2 09B, 1/2 09P and 2 0z processing solution. 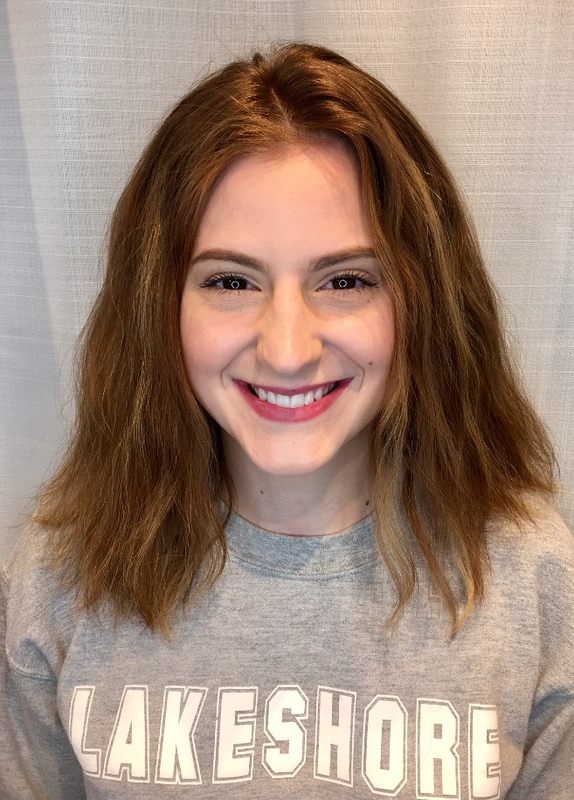 I did a graduated layer hair cut to remove bulk with vertical cutting and created a soft horizontal fringe with point cutting. Hair was styled with Pillow Proof Primer Spray and Guts 10 and a round brush. Take home recommendations pH Bonder treatment and Extreme shampoo and Conditioner. Iron Shape 11 is a must for any iron work on the hair.